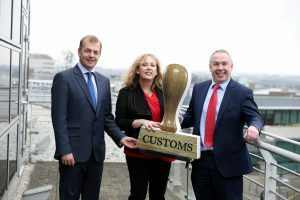 Dublin, 25th February 2018 – The Irish Exporters Association (IEA) this morning announced BDO Customs and International Trade Services (BDO) and Rhenus Logistics Ireland as sponsors of the organisation’s online customs services offering. Through a series of newsletters in 2018, the IEA, BDO and Rhenus Logistics Ireland will offer IEA members advice and assistance on exporting overseas and importing into Ireland on customs and trade. The online offering will keep IEA members and stakeholders informed of important country and sector specific information, supply chain, trade compliance, legislative updates and provide practical support and advice on customs issues. To view photos of launch click here. Represent the needs of members in the development of policy, lobbying, intervention at government level and in the media. Brexit and the Diversification of Export Markets, Cost Competitiveness, the War for Talent and Entrepreneurship are at the core. Trade Services include practical training, support and consultancy right across the supply chain including customs awareness and audits, export and import compliance, consular, business travel support, route to market and general assistance with trade related queries. Knowledge Networks will support members to: explore new markets, route to market scenario planning, understand customs and supply chain challenges and provide thought leadership through a series of events and webinars. Networking and connectivity remain an important part of membership benefits. The IEA represent the whole spectrum of companies within the export industry including SME’s who are beginning to think about exporting for the first time right through to global multinational companies who are already extensively exporting from Ireland as well as the providers of key services to the sector. It is the connecting force for Irish exporters, providing practical knowledge and support across the Island of Ireland and in foreign markets. BDO is one of Ireland’s leading Audit, Tax and Advisory firms, specialising in advising businesses across all sectors, ranging from the development stage through to successful international growth. With offices in Dublin, Limerick and an affiliate office in Belfast, BDO Ireland operates a partner-led approach in all client dealings which ensures our partners and directors are highly accessible to clients. At BDO, we build strong relationships with our clients and invest time in getting to know what really matters to them. BDO Ireland is a member of the international BDO network with over 74,000 people working with our clients and offering challenging, ethical and practical advice from 1,500 offices in 162 countries and territories. Our integrated global network already enjoys a reputation for delivering an outstanding service that is consistently better than that of our competitors, and BDO’s ambition is to become the market leader for exceptional client service. Turnover at the Rhenus Group tops € 4.8 billion, making it one of the leading logistics service companies with global operations. Rhenus has business locations at more than 610 locations worldwide and employs 29,000 people. The Rhenus business areas – Contract Logistics, Freight Logistics, Port Logistics and Public Transport – manage complex supply chains and provide a wealth of innovative value-added services.